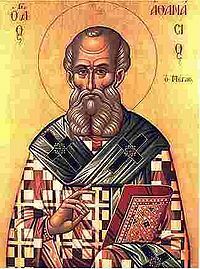 Tuesdays with Uncle Athanasius: How does the Salvation of Creation Tie in with Human Salvation? Will the rest of the natural world be saved along with humankind? We see corruption everywhere. You must understand why it is that the Word of the Father, so great and so high, has been made manifest in bodily form. He has not assumed a body as proper to His own nature, far from it, for as the Word He is without body. He has been manifested in a human body for this reason only, out of the love and goodness of His Father, for the salvation of us men. We will begin, then, with the creation of the world and with God its Maker, for the first fact that you must grasp is this: the renewal of creation has been wrought by the Self-same Word Who made it in the beginning. There is thus no inconsistency between creation and salvation for the One Father has employed the same Agent for both works, effecting the salvation of the world through the same Word Who made it in the beginning. Regenerating human beings ends up including a regeneration of our world. Picture it like God reaching down to scoop us up in His hands of grace, and because He grabbed so widely, He ends up grabbing the earth and cosmos too. All things to be reconciled to Jesus! (Compare Matthew 19:28, Colossians 1:19-20, and Revelation 21-22). Athanasius, On the Incarnation, chap. 1, sec. 1, http://www.ccel.org.